GreenPartStore has all the John Deere farm equipment parts you need. Our selection includes a full range of parts and accessories and we have access to a far larger inventory than we can list on our website, so if you're in need of a part you don't see here, make sure to give us a call and we'll get it for you. Our toll-free number is 888-432-6319. 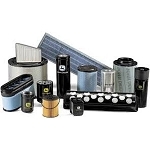 Our selection includes tons of parts including air, engine oil, fuel, and hydraulic filters. Clogged and dirty filters lead to problems with your vehicle that can result in loss of efficiency and even permanent damage, so make sure you stock up on the filters you need. The frequency of the need to replace filters partially depends on how much you use your John Deere vehicle and partially depends upon the environment. Very dusty areas will clog an air filter much faster. If you have any questions, please feel free to contact us and we'll be happy to give you the information you need.